A spending push in key infrastructure sectors, such as roads and railways, may be at the heart of the Centre’s efforts to rekindle the economy but attempts to prod the private sector to invest in core sectors seem to be floundering — if lending by banks is anything to go by. Bank credit to the infrastructure sector, which had been steadily sliding over the first eight months of the current financial year, has recorded its sharpest contraction of 6.7 per cent in November. The latest data released by RBI Tuesday shows that credit outstanding to the infrastructure sector has slipped from Rs 9,64,800 crore in March 2016 to Rs 9,00,700 crore in November 2016. The power sector, which accounted for almost 55 per cent of the infra credit demand, saw a contraction of 10.4 per cent in November — down from a decline of 4.8 per cent in April 2016. 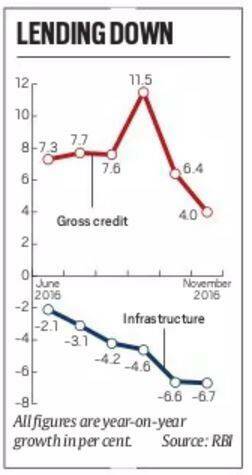 And, the road sector, which has seen significant government push, has witnessed a sharp decline in credit offtake over the last few months. In October and November, bank credit slipped to a low of 2.9 and 1.3 per cent, respectively, suggesting a decline in private sector demand for credit and a corresponding aversion by banks in lending to the sector. The decline in infrastructure credit growth has also pulled down the overall bank credit to the industry as it contracted by 3.4 per cent in November, which is the worst in at least a decade. Even the gross bank credit expanded by only 4 per cent in November, down from 9 per cent growth in March 2016. Recent data on highway construction show that the pace of construction has not picked up. In December, Minister of State in the Ministry of Road Transport and Highways, Mansukh L Mandaviya, informed Rajya Sabha that in the first seven months of FY’17, the length of highway construction stood at 3,591 km against the target of 15,000 km. In 2015-16, the length of highway construction stood at 6,029 km. Among several reasons cited by Mandaviya for the slow pace were land acquisition, utility shifting, non-availability of soil/aggregates, poor performance of contractors, etc. In his budget speech 2016-17, Finance Minister Arun Jaitley had announced a total outlay of Rs 97,000 crore for the road sector. However, private sector involvement seems to be very low. In the first eight months of the FY’17, the banks credit outstanding for the road sector rose by only Rs 2,700 crore from Rs 1,77,500 crore in March 2016 to touch Rs 1,80,200 crore in November 2016. Economists say the environment for private sector investment is “very weak” as of now and may remain out of the system for some time. “While government investment is one factor to crowd in private sector investment, there are other factors also required and they are not favourable as of now. There is too much debt in the books of infrastructure companies and also, a lot of companies are saddled with overcapacity. Even the banks are not very keen on lending to the sector as they have a lot of bad loans in the sector,” said DK Joshi, chief economist, Crisil.